Posters available to print and display for our current projects. Read the results of our surveys here. 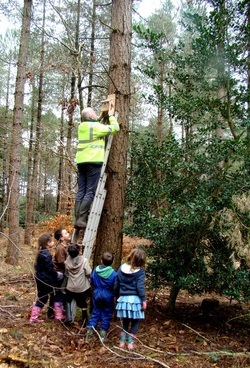 We currently have 5 bird boxes in the woods kindly donated by the Forestry commision. The Boxes were installed in March 2013 as part of our Volunteer Work Party with the Forestry Commission. They are located along Uddens Drive, south of the A31. The locations and trees were chosen by the children whose names are also on the boxes. We are really keen to hear of any activity seen around the boxes, as are Todd, Louisa, Kacey, Brynley & Evan. This is just the beginning of many bird and bat boxes we have planned for the woodland. We hope to have plans on the site soon for any budding carpenters! The Environment Theme Action Group brings to East Dorset skills and expertise on specialised environmental issues such as conservation, ecology including ecological aspects of climate change, environmental impact assessment and sustainability appraisal. We provide a unique forum for discussing and evaluating environmental aspects of policy and plans at District, County and Regional level and we submit detailed comments on consultations such as RSS, Local Development Framework, Waste and Minerals. We will colate them and forward them to ETAG. The following people are in a position to help us, but you MUST let them know how you feel! Please take the time to drop them a letter or email. Just put in your postcode and it will list your District & County Councillors as well as MP.